TLC412: The technique challenge at Splitcoast to let paper on the inside show. FS310: The Featured Stamper at Splitcoast this week – allee’s. Lynn is such a warm, kind person and has a vast gallery full of beautiful cards! This is her gorgeous card that I chose to CASE. Yes, you’re saying to yourself but this doesn’t look anything like her card. Well, what I pulled from her card was the technique and the brilliant colors. The technique is called water stamping. There is a fabulous tutorial by Splitcoast’s very talented TexasGrammy (Bev Girard) located here. OK, now onto the card…it starts with a standard A2 (4.25″ x 5.5″) card base in SU! Early Espresso. I cut the edge of the front of the card with the Verve Flourished Trim die, then cut an extra piece in the Early Espresso and place it on top of the striped edge. The paper on the front of the card has been made with the water stamping technique. I sponged three different Distress Inks on some white card stock and then stamped several different Tim Holtz images with water. Next, I flicked more water to add some water spots too. Because the Distress Inks are so reactive to water, I find they really work well for this technique. Next comes MFT’s Sentimental Flourish in Early Espresso. I offset the sentiment die cut from Verve so that the little tendrils of the flourish wrapped around the edge of the sentiment. It’s been stamped with Verve’s Grace Plain Jane sentiment. I cut a couple of leaves with the Dreamy Leaves die set from Verve, again in Early Espresso. Over those…some bling! Then the flower from Verve was stamped and fussy cut and layered with dimensionals. A little rhinestone and button adorn the center. And, for a little more interest…the pink rose trim was added. The inside has been finished with plain white card stock and a 1″ strip of a coordinating designer paper showing. Well that’s it for today my stamping lovelies…have a great week! Oh my goodness, this is gorgeous! 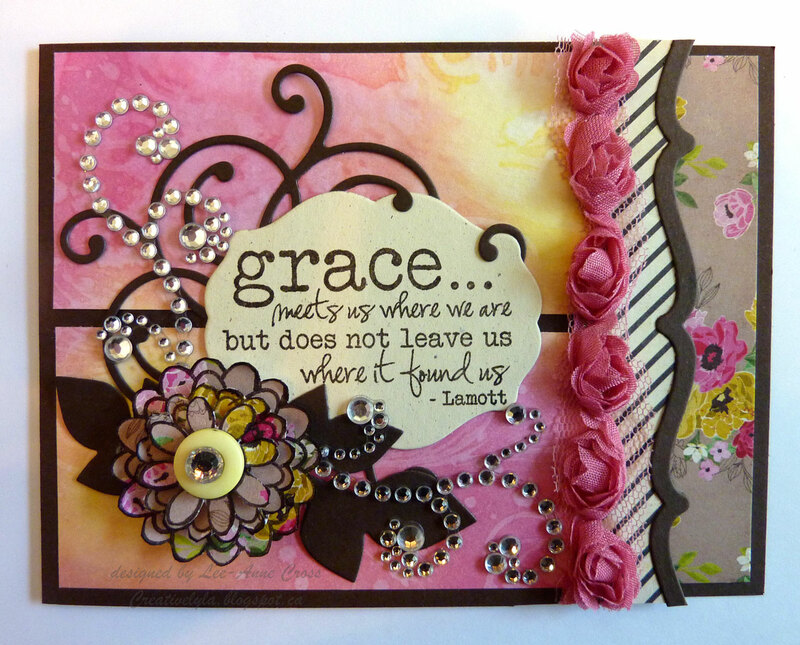 You've used the water stamping technique so well here and your colors are muted perfectly to showcase this beautiful sentiment. Your flourishes, flowers and DSP just work so well together. This is a stunning card! Gorgeous card. I love the flower, and the choice of colors. Thank you so much for sharing. Such a beautiful card. Love that watercolory background. Thanks for playing along with Mojo Monday! Carmen, thank you for your sweet comment…your kind words have totally brightened my day! Hugs! Now, to answer your question…I fussy cut the flower as there currently is no coordinating die. Again, thank you Carmen! It's people like you that make the crafting community such an awesome place to be!